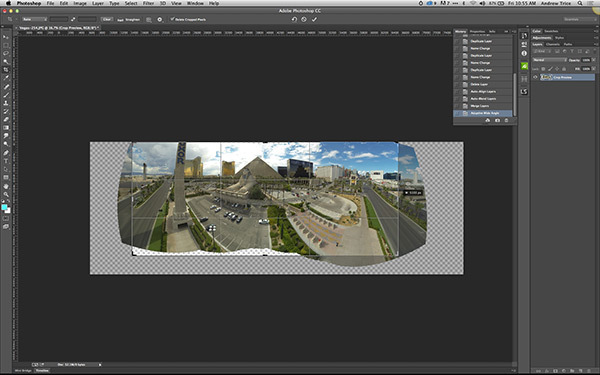 A panorama is a wide-angle view, usually captured with either a special lens, or by stitching together multiple images to create the wide angle view. 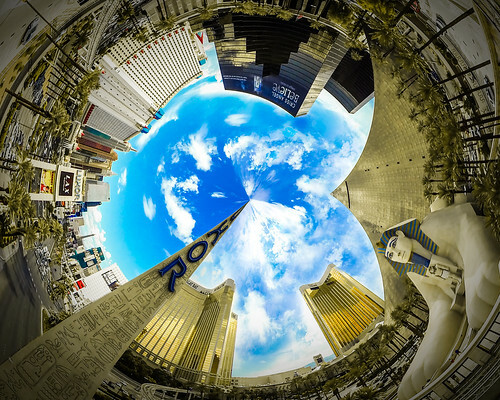 A 360 degree panorama is a representation of the wide angle view into a sphere. 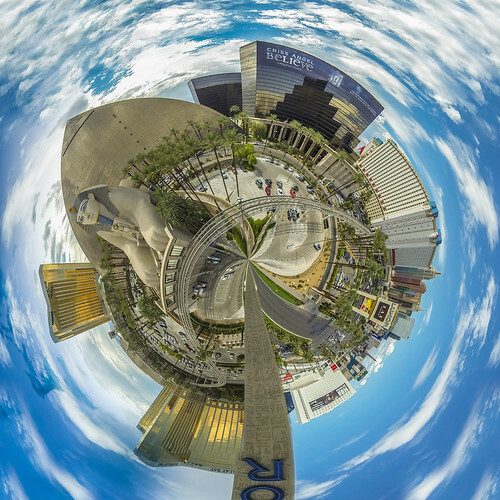 This image was created in Photoshop by taking multiple images which were captured by GoPro attached to a remote controlled helicopter, stitching them together to create a wide angle panorama, then creating a 360 panorama from the wide angle panorama. Pretty cool, right? I had a great time putting this together. Just ask any of my friends, and they will tell you that I have been completely obsessed with this. It’s not a new technique – This has been around for years, but it’s one not everyone knows off of the top of their head. You should know how to do it too! 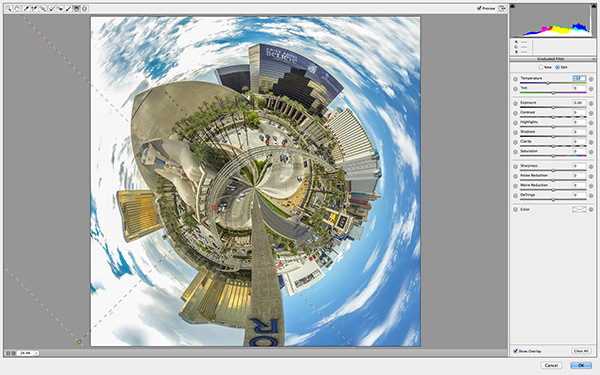 I did a manual process that is a variation of these… The original images I had were from a GoPro Hero 3 camera. 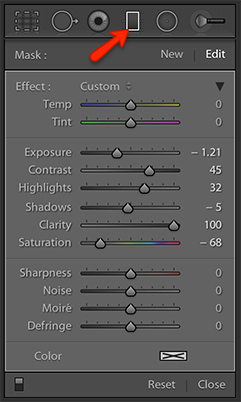 I applied lens profile correction in Lightroom, then loaded the images into Photoshop as separate layers of the same PSD composition. 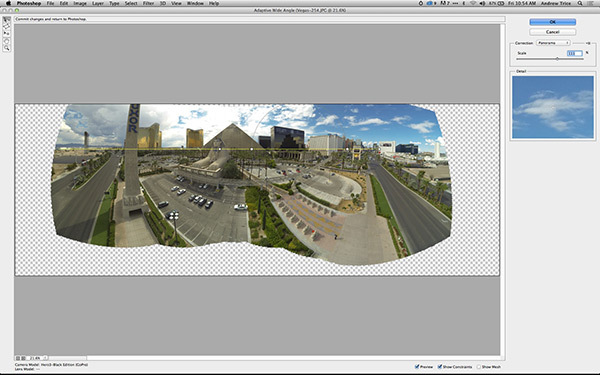 Then I used auto-align layers and auto-blend layers to merge the images into a single panorama. Next, make sure that the image is straight. It’s best to have a level horizon, without significant curvature. 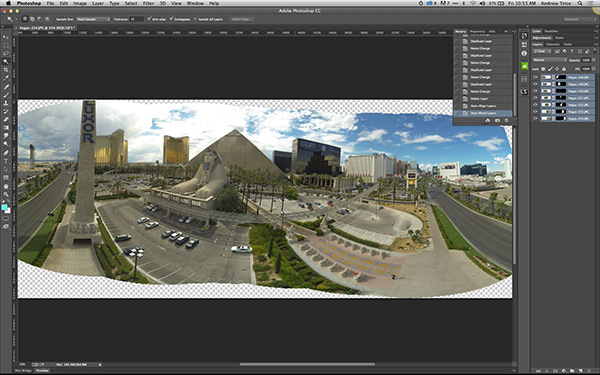 You can straighten the horizon/lens distortion using Adaptive Wide Angle in Photoshop. 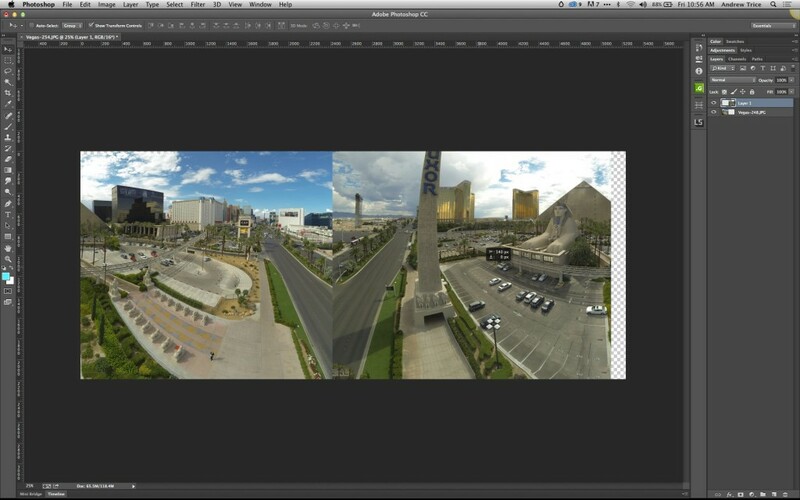 Check out this video tutorial also from Russell Brown to learn more about Adaptive Wide Angle in Photoshop. You’ll want to rotate and crop the image so that the horizon is level, and you get rid of missing areas within the image. If you’re missing part of the image, but you don’t want to crop any more, you can use content aware fill or the clone stamp to synthesize the missing parts. 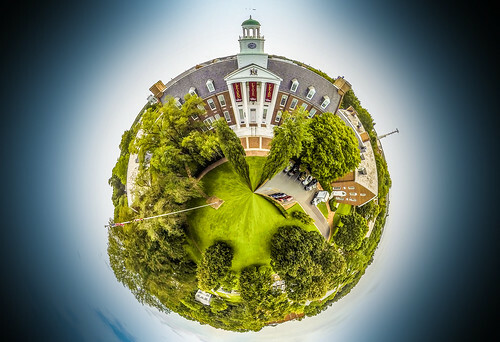 You don’t necessarily need a full view of 360 degrees to create these types of images, but you will get the best results if the image doesn’t have any glaring seams. The way that I usually go about doing this is by splitting the image in half, and swapping the two sides so that the seam is in the middle of the image, with some overlap. Then I use Photoshop’s clone stamp, brushes, or content aware fill to get rid of any glaring visual seams so that it is one complete image. You’ll probably need to crop this again to get rid of any whitespace introduced from the overlapping. 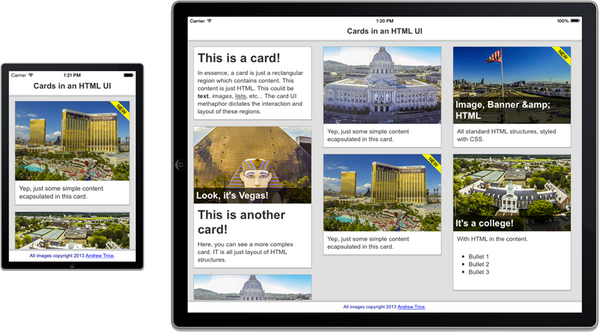 Just go to Image->Image Size and make the width and the height of the image the exact same value (you’ll need to unlink width and height). This will stretch your image out vertically – don’t worry, the stretching is OK and is part of the process. Next, you’ll want flip the image so that it is upside down. 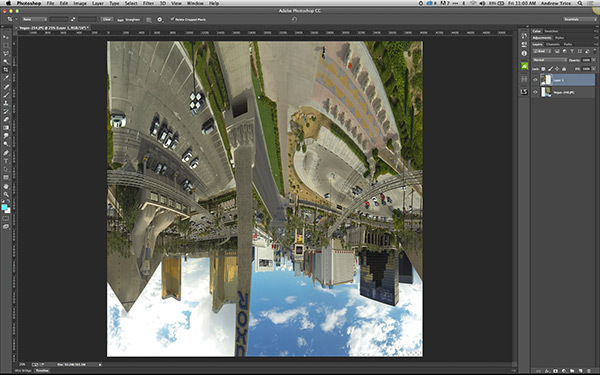 You can do this either by going to Edit->Transform->Rotate 180, or Edit->Transform->Flip Vertical. Make sure that your image has been flattened or that all layers are within a smart object, so you are applying this filter to only one layer. Select the target layer, then go to Filter->Distort->Polar Coordinates. Make sure that the “Rectangular to Polar” option is selected, and hit “OK”. When you apply the distortion filter, the content in the top 25-30% of your image will be stretched out, and the bottom 25-30% will be pinched/squeezed, so just be aware that this will happen. You will want to play around with this feature with variations of image cropping to get a feel for what it will do to your images. 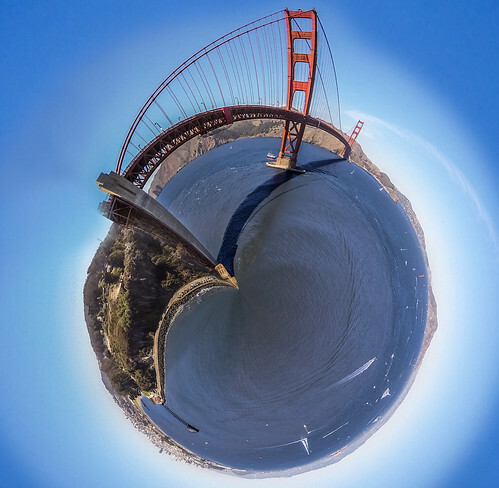 At this point, you will now have a 360 spherical panorama, but you might not be 100% happy with the output. If you don’t like how the distortion was applied, go back and change cropping and try again. If you want to make the colors “pop”, try applying Camera RAW as a filter. 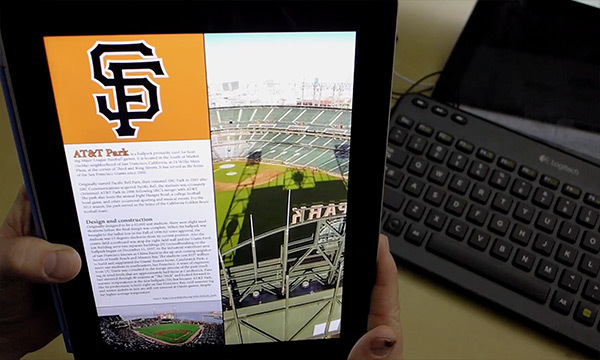 You’ll also notice that the corners of the image are partially transparent and stretched badly… you can crop this area, retouch the area, or layer assets within a composition. This is really up to you as the creator of the composition. 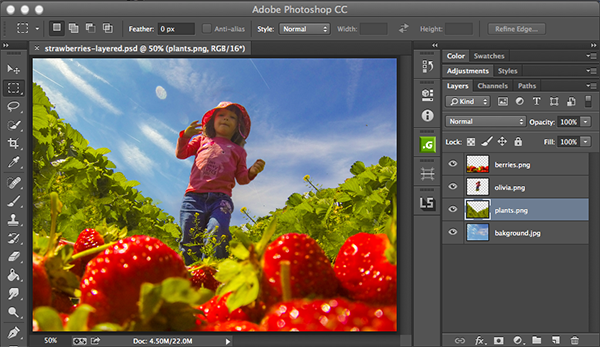 Whatever you do, take advantage of Photoshop – it has a LOT of features you can use to enhance your creativity. To see the final output at a higher resolution, check it out on my Flickr account! 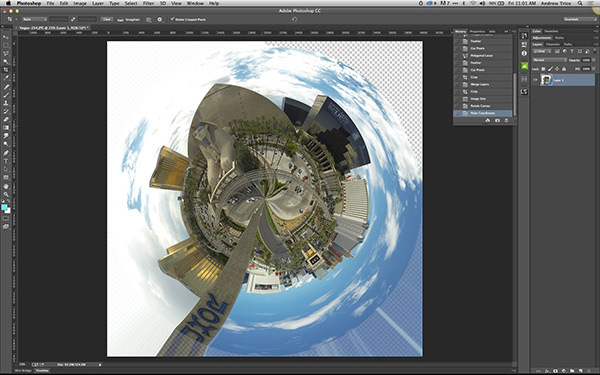 Or check out my Flickr set to see other spherical panoramas. 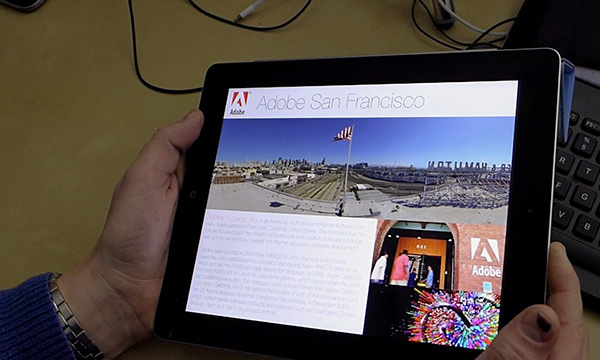 All of which are a part of Adobe Creative Cloud. If you’re not already, become a member today and unleash your creativity! 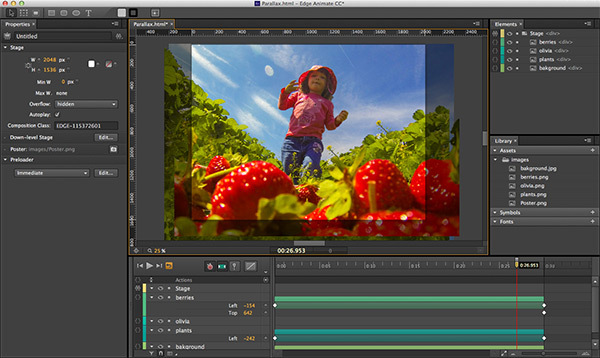 One of my favorite parts of Creative Cloud is that it gives you everything you need to be creative. Whether you are into photography, video, illustration, print design, web design, or just dabble in creativity, Creative Cloud has everything that you need. I’ve been doing a lot of photography lately. 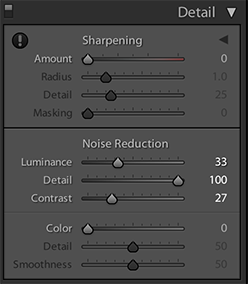 My main tools for retouching images are Photoshop and Lightroom – Photoshop for the heavy edits and re-composition, and Lightroom for retouching/color correcting and bulk edits. Using either of these tools you can turn images that originally looked “blah” into “Awesome!” – hence my tag line “bringing out the awesome”. One great feature that I use in both of these tools is the ability to retouch colors using Adobe Camera RAW (In Photoshop CC this is a filter, in Lightroom this is under the “Develop” tab). This gives you the ability to enhance colors, enhance clarity, add effects, heal, and much more, and it is all relatively easy once you get the hang of it. Check out the images below for before and after shots of a photo I recently captured from a flight over Charlotte, NC. That entire composition retouch only took a few minutes. 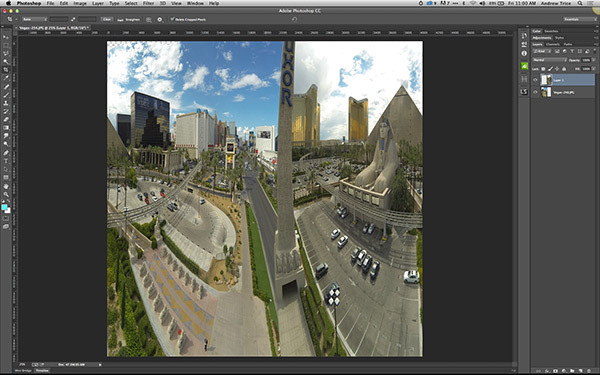 Here’s what I used inside of Adobe Photoshop Lightroom to put it all together. 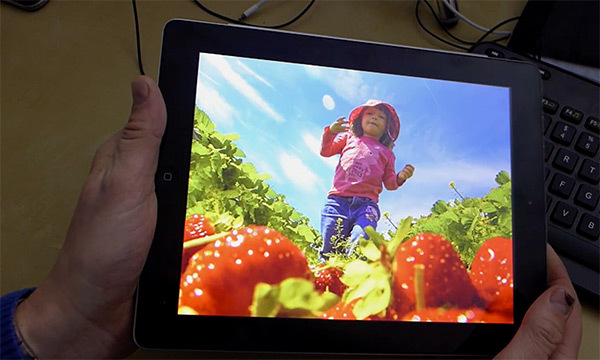 The “Basic” panel gives you the ability to quickly adjust color temperature, tint, exposure, contrast, highlight/shadows/white balance, and enhance clarity and color saturation as it applies to the entire image. Just drag the sliders to see the impact in real time. 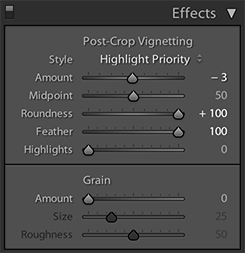 The “Effects” panel gives you the ability to add a vignette effect to your images. 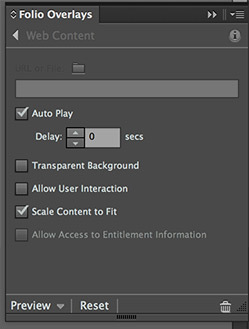 You can adjust the sliders to increase vignette amount, midpoint size, roudness, feather, and more. 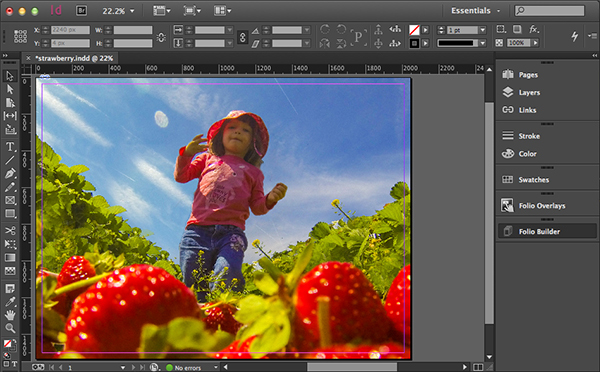 The “Detail” panel gives you the ability to sharpen or reduce noise in your images. In this case I used it to reduce luminance (brightness) noise on the image, but you can also apply noise reduction to colors. 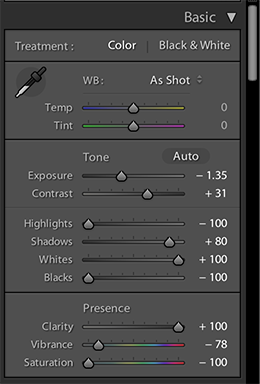 The Graduated Filter and Adjustment Brush allow you easily apply localized adjustments to areas within your image. In this case, I applied two graduated filters: one to bring out contrast and definition in the sky, and another to darken and unsharpen the ground. Read more in the Lightroom documentation to learn how to use both the graduated filters and adjustment brush. … and that’s all I did. I didn’t even use a big fancy camera to take this photo. I used a Panasonic Lumix LX7, which is a pretty good point and shoot camera, but it’s definitely not a DSLR. If you want to see a bit more detail, check out a higher resolution variation over on my Flickr page. Now, get out there and create amazing compositions and images. If you’re not already a member of Creative Cloud, join today at creative.adobe.com. You should definitely check it out, and enjoy!